What does the famous desert destination of Palm Springs, situated in the Coachella Valley of Southern California, evoke for you? Luxuriant golf courses, stylish shopping, upscale resorts, and elegant restaurants? Yes, Palm Springs is all this, but it is much more. It is a destination with a rich history, architectural treasures and refreshing ambiance, particularly when you focus on the celebrity enclave of the 20s and 30s called Old Palm Springs, an historic neighborhood away from the ritzy glamour of the rest of the city. 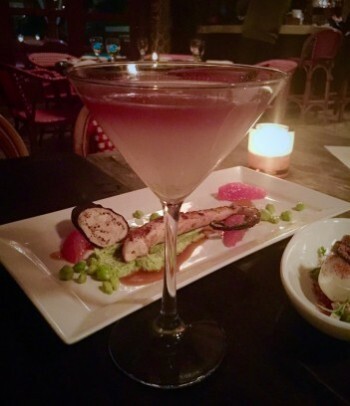 We discovered a bit of Old Palm Springs recently when we stayed at the boutique Colony Palms Hotel and dined in its Purple Palm restaurant. Although this charming, Spanish colonial style hotel is located in the heart of Palm Springs, it is a peaceful retreat that transported us back to a time when Hollywood stars sought out Palm Springs as a tranquil hideaway from the pressures of celebrity. 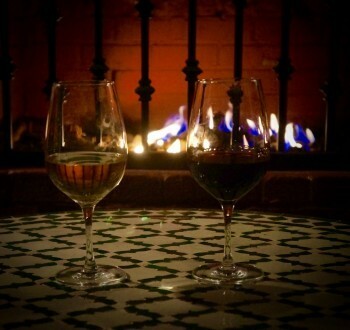 As we stepped into the hotel’s vintage lobby, sipped on a welcoming rosé, and gazed at the lovely deep blue pool, we could easily imagine Frank Sinatra, Marilyn Monroe, Clark Gable, Rita Hayworth, Humphrey Bogart and Dean Martin sunning in lounge chairs while sipping classic cocktails. And we were thrilled to learn that the Purple Palm restaurant is celebrating Frank Sinatra’s 100th birthday with a special menu throughout December. The Colony Palms Hotel, built in 1936 by reputed notorious Purple Gang Mobster, Al Wertheimer, was originally a speakeasy, saloon and gambling house. Set on three acres of lushly landscaped property with meandering stone walkways, the hotel includes 42 rooms, 5 suites and 8 casitas. 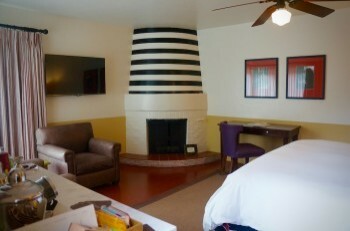 Our room, a deluxe king, was cheerful and inviting, with a beautifully working fireplace, original mosaic tiles, and vibrant fabrics. The two slightly worn and immensely comfortable leather chairs were perfect for leaning back with a drink and watching the flickering flames. (Of course, there was a full bar in our room.) The bed linens were exquisitely soft and comforting. The tiled shower was huge and luxurious. We were also intrigued by the black and white vintage photos accenting our walls and seen all over the property. 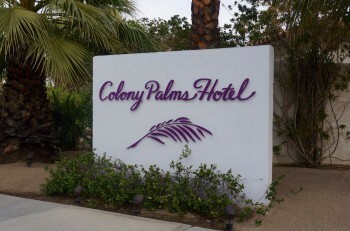 And the prices at the Colony Palms Hotel are refreshingly reasonable for Palm Springs, with room rates starting at about $169 during the week. We met the restaurant’s personable manager, Allen Cannarutto, who described the changes taking place in the restaurant since its new ownership came on board. 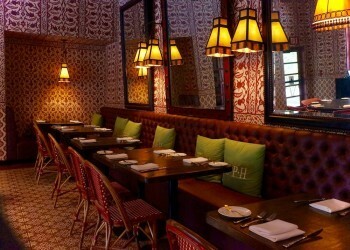 (Several months ago the property was purchased by the Moana Restaurant and Palisades Hospitality Groups.) While still retaining the restaurant’s original character, the Purple Palm's new management is making some changes. New menu items reflect the creativity of its relatively new Executive Chef, Cale Falk, who also sat down with us to discuss his menu and approach to creating dishes. 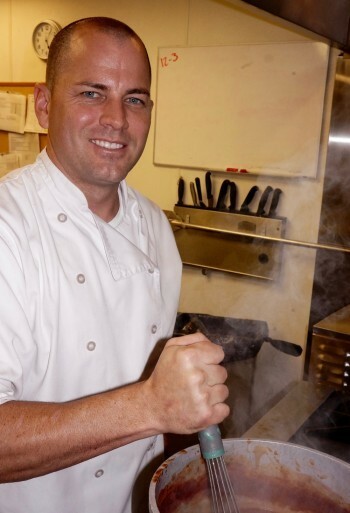 Since Chef Cale, who was trained at Le Cordon Bleu in Scottsdale, began at the Purple Palm five months ago, he has completely changed the menu with a focus on fresh, seasonal, California ingredients, on an imaginative combination of flavors and textures, and on enticing small plate options. 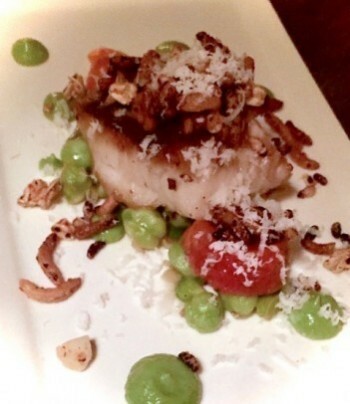 We tasted a variety of Chef Cale’s innovative creations. First we savored perfectly tender and flavorful octopus surrounded by a tasty, unique garbanzo bean pesto and a surprising slice of grapefruit that provided just the right contrast in flavor. It’s hard to prepare octopus that is not rubbery and is still delicious, but Chef Cale has mastered this dish. We also really enjoyed a slightly soft duck egg accented with Fresno chile, black garlic and other spices. For entrees we sampled three signature dishes. We had never tasted black cod like Chef Cale’s and we are probably now forever spoiled because we will compare any black cod dishes we taste in the future to his exquisite dish, which featured unique pickled strawberries, avocado, garbanzo beans and crispy coconut. The creamy salmon that followed was accompanied by bok choy, braised fennel and a delicious yuzu-fennel puree. As with the octopus, it is a challenge to find salmon perfectly prepared, not overdone but done enough, and this was perfect. Finally, we enjoyed a savory, tender pork chop creatively served with charred cabbage, soy mushrooms, and topped with an ancho chile glaze. The bitter and sweet flavors were a sublime combination. One of Chef Cale’s original recipes, Tuscan Kale Pesto, is included at the end of this article. Chef Cale emphasizes that he makes an effort to please any customer request, including preparing gluten-free or vegetarian dishes. 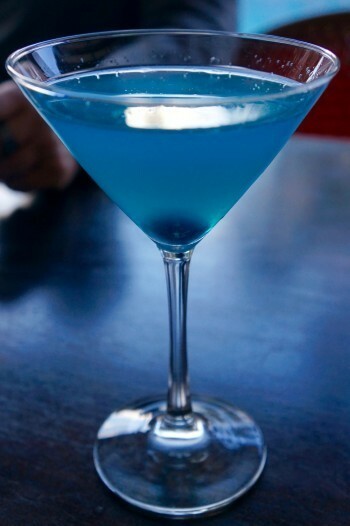 Also your choice of Prosecco or Frank’s favorite ‘Ol Blue Eyes Martini is included. We sampled the Ol’ Blue Eyes Martini and can attest that it is a delectable mixture of vodka, Blue Curacao, sweet and sour mix, with a splash of Pavan liqueur and a hard-to-find blue Maraschino Cherry. Ol’ Blue Eyes would have loved it and we did too. The enticing Libations menu includes other scrumptious craft cocktails, some based on traditional classic drinks, that are made from fresh ingredients. I also really enjoyed the 1805 Old Fashion, made of bourbon, sugar, and orange bitters, all uniquely accented with a burning stick of rosemary that infuses throughout the smoky drink. Tantalizing special menus are also being offered on Christmas Day and on New Year’s Eve. Reservations for these special holiday meals can be made by calling the Purple Palm at 760-969-1818. 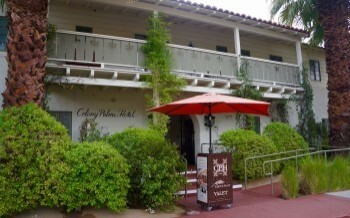 For more details go to the restaurant’s website: http://www.colonypalmshotel.com/dining/ Reservations for the Colony Palms Hotel can be made by calling 760-969-1800. There are specials going on at the hotel during December, including restaurant and hotel discounts, plus a surprise commemorative gift that comes with each room reservation. Clean and de stem kale. Once shallots and garlic are chopped, get a hot pan ready. Once pan is hot, sauté garlic and shallots until translucent, making sure not to burn. When ready, add kale and sauté until kale turns bright green. Then remove and cool and then chop kale coarsely. Add all ingredients to food processor, except oil, and pulse until all is incorporated, while slowly adding oil to emulsify. Season with salt & pepper. Chef Cale says this pesto would work well as an appetizer on grilled flatbread, or served with grilled chicken or crusted halibut.